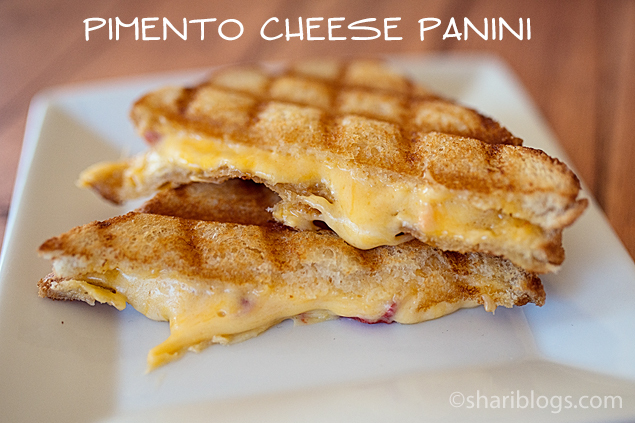 Pimento Cheese Panini… say that with me. Sounds wonderful, doesn’t it? I have to make a confession that for the longest time I wouldn’t touch pimento cheese. My mom and my husband love it, but I just couldn’t bring myself to eat it. Then one day while we were eating at Newk’s, my husband insisted that I try their Pimento Cheese sandwich. Well, as much as I hated to admit it, I loved it. Being the foodie that I am, I knew that I had to come home and try to make something similar. I mean how could you NOT love all the melted cheesy goodness. 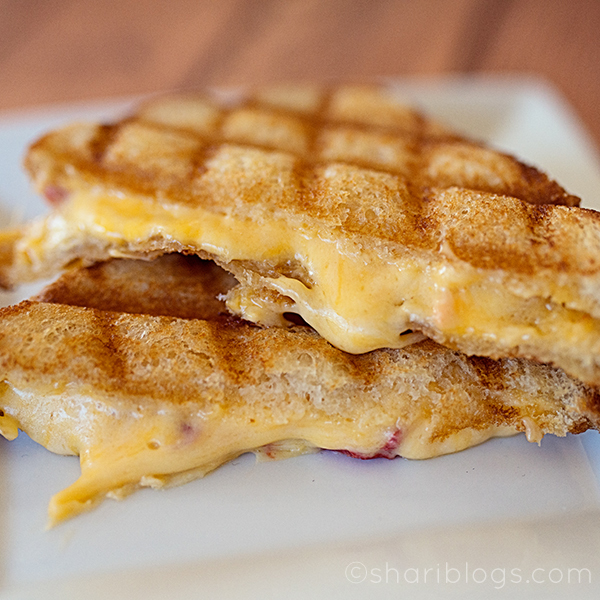 My mouth is watering just typing this post and looking at that picture!! Grate your cheddar cheese and monterey jack cheese and put into a medium size bowl. Add mayo to the grated cheeses. Then add in the drained diced pimentos and garlic powder. Chill for 3-4 hours. This really helps the flavors blend well. Heat up your panini maker or skillet on the stove. Cover one side of each piece of bread lightly with butter. Spoon and spread pimento cheese spread onto the non-buttered side of bread. Place butter side of bread face down into the skillet or panini maker. Place the other piece of bread on top with butter side facing up. After bottom of sandwich begins to brown, flip over. Grill until both sides are your grilled to your liking. For a panini style in a skillet, place a heavy pan or saucer on top of the sandwich while it grills to flatter the sandwich. ** I used a low carb bread which is why my sandwich is pretty skinny. If you want a heavenly sandwich, try using sliced ciabatta or french bread. It was a long time before I would try pimento cheese too. Didn’t matter how often it showed up, my answer was always no. Then a good friend made a pimento cheese dip that he insisted I try. would love to try it on a sandwich. ..all melt and rich. Looks delicious!